Transport in Pakistan (Urdu: پاکِستان میں نقل و حمل‎) is extensive and varied, and serves a population of over 191 million people. In recent years, new national highways have been built, with the addition of motorways which have improved trade and logistics within the country. Pakistan's rail network owned by Pakistan Railways is also undergoing expansion in recent years. Airports and seaports have been built with the addition of foreign and domestic funding. Lahore Junction Railway Station, c.1895. The history of transport in modern-day Pakistan dates back to the Indus Valley Civilization. The Grand Trunk Road was a major road commissioned by Sher Shah Suri in the 16th century and used during the Suri and Mughal periods. Trees were planted, and mosques and temples built along the road. Caravanserais were built for travelers to spend the night. Railways and Airways were developed during the British Raj. The first railway's in Pakistan were built from 1885. The construction of motorways began in the early 1990s, with the idea of building a world-class road network and reducing the load on the heavily used national highways throughout the country. The M2 was the first motorway completed in 1998, linking the cities of Islamabad and Lahore. In the past 5 years, many new motorways have opened up, including the M1 and M4. The M4 is partially operational while half is under construction, and connects the cities of Pindi Bhatian (M2), Faislabad and Multan via Gojra, Toba Tek Singh, Jhang, Shorkot, Pir Mahal and Khanewal. The M3, which will connect Lahore with Multan through Abdul Hakeem and the existing M4 near Multan, is under construction; it will terminate at the under-construction M5, which will lead to the Sukkhur District of Sindh. There, the M6 (which is proposed with construction work to begin soon) will start; the M6 will end at Hyderabad, where it will meet the existing M9 motorway to Karachi. In addition to this, the M8 in Baluchistan province, the longest motorway of Pakistan, is half under construction, half operational. In central Punjab, the Lahore-Sialkot Motorway (M11) is under construction and will be operational by next year, and in KPK province, the Hakka-Dera Ismail Khan Motorway (M14) is also under construction. Swat Motorway and Hazara Motorway are two more expressways under construction in KPK province. During the 1990s, Pakistan began an ongoing project to rebuild all national highways throughout the country specifically to important financial, cargo and textile centers. The National Highway Authority or NHA is responsible for the maintenance of all national highways in Pakistan. The Makran Coastal Highway follows the coast of Sindh and Balochistan provinces, linking Karachi and Gwadar. Journey time has been reduced to six or seven hours with the construction of the new Coastal Highway. The highway was built as part of an overall plan to improve transport facilities in southern Balochistan. The Grand Trunk Road (commonly abbreviated to GT Road) is one of South Asia's oldest and longest major roads. For several centuries, it has linked the eastern and western regions of the South Asia, running from Bengal, across north India, into Peshawar in Pakistan. The Silk Road is an extensive interconnected network of trade routes across the Asian continent connecting East, South, and Western Asia with the Mediterranean world, including North Africa and Europe. It passes through the midsection of Pakistan through cities: Peshawar, Taxila and Multan. Within cities, buses provide a significant role in commuting a large number of travellers from one city to another. Recently, large CNG buses have been put onto the streets of various cities, primarily Karachi and Lahore, and recently Islamabad, as the minivans which were originally used were beginning to cause large traffic problems. Private yellow and white minivans have services throughout cities in Pakistan and get commuters from one point of the city to the other at a low cost. Since 2000, however, the government has taken a comprehensive initiative to modernize the existing bus fleets and minimally impact the environment. This public-private enterprise would gradually introduce 8,000 CNG buses throughout the country and 800 buses in Karachi. This venture will ensure high standards of efficiency and cleanliness. Bus service in urban areas and between cities is well established with services run by both public and private sectors. Bus services like Raja Bus Service (Azeem Bhatty), AL-SYED Transport, Waraich Buses, Daewoo Express, Rehber Travel, Bilal Deawoo, Faisal Movers, Kohistan, Khan Brothers, Skyways and Niazi Express have set up a modern intercity service which connects to most cities in Pakistan and runs 24 hours a day. Intercity buses tend to be more modern and well kept. The TransLahore is a bus rapid transit (BRT) system in Lahore. The Lahore Transport Company was established in 1984 to ease the traffic conditions of Lahore and improve bus services. The Company was assigned responsibility for transport in Lahore in December 2001. A BRT fleet of 650 buses was introduced. It was named TransLahore. However, the bus rapid transit system (BRTS) did not have dedicated lanes and had to share roads with regular traffic with no right of way. This resulted in a system that was a BRTS only in name. Lahore: Metrobus (Lahore) Bus Service was inaugurated on Feb 10, 2013 by CM Punjab Shehbaz Sharif. It consist of 27-kilometres long road track for the Metro Bus Service, from Gajumata to Shahadra, out of this track 8.5 km is elevated. It has 27 bus stations and e-ticketing and intelligent transportation system are part of the MBS. Islamabad-Rawalpindi: Rawalpindi-Islamabad Metrobus Service is an operational bus rapid transit system which connects key areas in city of Rawalpindi and the national capital city of Islamabad. It is 24 kilometres (15 mi) long, and has 24 stations. The project was inaugurated on 4 June 2015 by Prime Minister Nawaz Sharif. Multan Metrobus is an operational bus rapid transit in the city of Multan. The 18.2 kilometres (11.3 mi) long BRT system connects the main commercial areas of the city. Karachi Metrobus is planned for city of Karachi. It will consist of 5 corridors and will have total length of about 109 kilometres (68 mi), of which the Green and Red Linea are about to go into a construction phase. Orangi to Board Office (3.9 km). TransPeshawar is a bus rapid transit system for the city of Peshawar. The project is under the consideration of PTI led Government of Khyber Pakhtunkhwa. PMTS will be a bus rapid transit system.Which will be initially constructed on one red line having length of 18.4 kilometer from Chamkani to Hayatabad area of Peshawar. Faisalabad: Faisalabad Metrobus is a planned, single line BRT System, similar to Lahore Bus Rapid Transit System. Metro line will connect Faisalabad International Airport to City Bus Terminal, passing through main hubs of the city. Construction is expected to start at the end of 2015. Another very common form of transport, seen mainly at hotels and airports, are yellow taxis. Drivers charge according to a meter located on the dashboard of the car, but fares can be negotiated if there is no meter. The cab drivers are reliable and will take passengers to any destination required. There are also numerous privately run services that use cars and minibuses of various types throughout Pakistan, providing a reliable and quick means of transport. Recently, the Radio Cab was introduced in Pakistan, which allows riders to call a toll-free number to get in touch with the closest taxi stand. This service is currently offered in Islamabad, Rawalpindi, Karachi, Peshawar and Lahore. Services for Hyderabad and Faisalabad are now being set up. Another local cab service was introduced in August, 2017 with the name iCAB, claiming to be the first cab service of the country with a centralized platform for all kinds of road transportation services, providing app-based services and getting stupendous response from the people of Pakistan. Launched from the capital territory, iCAB will expand its operations to overall 13 cities of the country. Over the years, the number of cars on Pakistani roads has tripled. Traffic jams are a common scene in major cities across Pakistan. The most popular cars on Pakistani roads are the Suzuki Mehran, Suzuki Cultus, Suzuki Alto, Suzuki Bolan, Daihatsu Coure, Hyundai Santro, Honda Civic, Honda City, Honda Accord, Toyota Corolla, Daihatsu Mira, Nissan Dayz, and Toyota Vitz. Luxury SUVs and cars are owned by the elite in urban cities and by many large landowners in the villages and rural areas, thus making them a fairly common sight in Pakistan. The most popular models are the Toyota Land Cruiser, Toyota Prado, Land Rover Range Rover, along with several Mercedes-Benzes, BMWs and Audis. Initial design was giving a mileage of around 450 kilometres to a litre but we are trying to improve that number to more than 700 km/litre after switching to a hybrid model. Auto rickshaws are a popular method of travelling in cities and are found in almost every city and town in Pakistan. The fare is usually negotiable before commencing a journey; however, due to the level of pollution contributed by auto-rickshaws, the government has recently begun banning older ones and replacing them with CNG auto rickshaws, which tend to be less noisy, form less pollutants and are much bigger and more comfortable. The Punjab government decided in 2005 to replace two-stroke three-wheelers with CNG-fitted four-stroke rickshaws in Lahore, Multan, Faisalabad, Rawalpindi and Gujranwala. Three manufacturers were ordered to produce 60,000 four-stroke vehicles, but they reportedly supplied 2,000 to the government which are now plying on city roads. Similar ordinances are now being considered in other provinces of Pakistan. A new form of transport in Pakistan is the Qing-Qi (pronounced "ching-chee"), which is a cross between a motorcycle and auto-rickshaw. It runs just like a motorcycle but has three wheels instead of two and can carry a much heavier load. It is an urban transport vehicle and is used mostly for short distances. Rail services in Pakistan are provided by the state-run Pakistan Railways, under the supervision of the Ministry of Railways. Pakistan Railways provides an important mode of transportation in Pakistan, catering to the large-scale movement of people and freight. The railway network comprises 8,163 km all of which is 5 ft 6 in (1,676 mm) gauge, including 293 km of electrified track. Passenger earnings comprise 50% of the total revenue. During 1999–2000 this amounted to Rs. 4.8 billion. Pakistan Railways carry 65 million passengers annually and daily operate 228 mail, express and passenger trains. Pakistan Railways also operate special trains for various occasions. The Freight Business Unit with 12,000 personnel operates over 200 freight stations on the railway network. The FBU serves the Port of Karachi and Port Qasim as well as in various other stations along the network and generates revenue from the movement of agricultural, industrial and imported products such as wheat, coal, fertiliser, cement and sugar. About 39% of the revenue is generated from the transportation of petroleum, 19% from imported wheat, fertiliser and rock phosphate. The remaining 42% is earned from domestic traffic. The freight rate structure is based on market trends in road transport, which is the main competitor to rail transport. Prime Minister Nawaz Sharif said that a high-speed rail network will be built which will connect Peshawar to Karachi via all major cities of Pakistan during his visit to China in June 2016. The Government is making plans for this project. The Karachi Circular Railway, which opened in the early 1940s, is the only functioning Mass Transit System in Pakistan. In 1976, Karachi was slated to begin work on an underground metro system, but plans have been put on hold since. The Lahore Metro Bus System is another rapid mass transit system which was tested by the Chief Minister of Punjab Shahbaz Sharif on December 25, 2012. It began operation on February 11, 2013. Lahore Metro would be the first mass transit system of it type in Pakistan. Peshawar Metro is also planned. On 22 May 2014, Pakistan and China signed a $1.6 billion agreement for a metro train project in Lahore. The Government decided to build the Orange Line of Lahore Metro. Work on the project will start in 2014 and will be completed within 27 months.The total length of the project will be 27.1 km, of which 25.4 km will be elevated and 1.7 km underground. In Lahore, Lahore Central Railway Station is the main railway station. Shahdara Bagh, Badami Bagh, Mughalpura, Shahdara Town, Lahore Cantonment, Wagah, Walton Cantonment, Kot Lakhpat, Kahna Nau, Jia Bagga and Raiwind are other busy railway stations located in Lahore. These urban railway stations of the city are served by commuter trains of Lahore. A large number of commuters use these station to get access to the city of Lahore. The Lahore Metro or Lahore Rapid Mass Transit System (LRMTS) (Urdu: لاہور میٹرو‎) is a rapid transit metro system under construction in Lahore, the second largest city of Pakistan. First proposed in 1991, funding was not secured, and in 2012 it was abandoned by the Punjab government in favour of the more cost–effective Lahore Metro Bus System which opened in February 2013. However, the Punjab Government decided to restart development on the Lahore Metro as a $1.6 billion project with Chinese assistance. The Orange Line, which will be 27.1-kilometre (16.8 mi) long, (25.4 kilometres (15.8 mi) of which will be elevated), will be the first line of the project and is under construction. India - Thar Express to Karachi and the more famous Samjhauta Express international train from Lahore, Pakistan to Amritsar (Attari) and Delhi, India. The weekly Thar Express also runs between Karachi and Bhagat Ki Kothi (near Jodhpur, Rajasthan). Iran - A 5 ft 6 in (1,676 mm) railway line runs from Zahedan to Quetta, and a 4 ft 8 1⁄2 in (1,435 mm) standard gauge line is finished from Zahedan to Kerman in central Iran, linking with the rest of the Iranian rail network. On May 18, 2007, a MOU for rail cooperation was signed by Pakistan and Iran under which the line will be completed by December 2008. Now that the rail systems are linked up at Zahedan, there is a break-of-gauge between the Islamic Republic of Iran Railways 4 ft 8 1⁄2 in (1,435 mm) standard gauge tracks and Pakistan Railway's Indian gauge tracks. 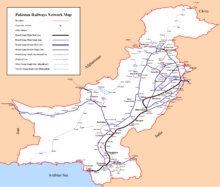 Afghanistan - Currently there is no rail link to Afghanistan since no railway network is present in that country, however Pakistan Rail has proposed to help build an Afghan Rail Network in three phases. The first phase will stretch from the Chaman to Spin Boldak in Afghanistan. The second phase will extend line to Kandahar and the third phase will eventually connect to Herat. From there, the line will be extended to Khushka, Turkmenistan. The final phase would link 5 ft 6 in (1,676 mm) with Central Asian 1,520 mm (4 ft 11 27⁄32 in) Russian gauge. It is not clear where the break-of-gauge station will be. The proposed line will also be connected the port town of Gwadar via Dalbadin and Taftan, thus connecting the port town to Central Asia. China - There is no link with China however, on 28 February 2007 contracts were awarded for feasibility studies on a proposed line from Havelian via the Khunjerab Pass at 4730 m above sea level, to the Chinese railhead at Kashgar, a distance of about 750 km. Turkmenistan - Via Afghanistan (proposed) – avoiding 4 ft 8 1⁄2 in (1,435 mm) standard gauge intervening. Turkey - An Istanbul-Tehran-Islamabad passenger rail service was proposed recently. Meanwhile, a container train service was launched by the former Prime Minister of Pakistan Yousuf Raza Gilani between Islamabad and Istanbul on 14 August 2009. The first train carried 20 containers with a capacity of around 750 t (738 long tons; 827 short tons)  and will travel 6,500 km (4,000 mi) from Islamabad, through Tehran, Iran and on to Istanbul in two weeks' time. According to the Minister for Railways Ghulam Ahmad Bilour, after the trial of the container train service, a passenger train will be launched. There are also hopes the route will eventually provide a link to Europe and Central Asia, and carry passengers. There are also several smaller airports which have flights to and from the Gulf because of the large Pakistani diaspora working in the region. There are 91 airports with paved runways, of which 14 have runways longer than 3,047 meters. The remaining 48 airports have unpaved runways including one airport with a runway longer than 3,047 meters. Pakistan also has eighteen heliports. The waterway network in Pakistan is in its infancy, with Karachi being the only major city situated next to the Arabian Sea. Still, plans are being proposed for the development of the waterways in the country along the Indus River and through the Punjab as it would boost employment opportunities and the economic and social development of Pakistan. See a list of dry ports and sea ports in Pakistan. Ferry services run between Kimari and Minora Island in Karachi. Karachi used to have a ferry connection with City of Mumbai in India until the 1960s, but it was later discontinued when both the countries went into war. A cruise service called Gulf Dream Cruise began between Karachi and Dubai in 2006, but it wasn't able to go beyond its first sailing due to visa issues imposed by the UAE authorities. Length of pipelines for crude oil is 2,011 km (1,250 mi). Length of Petroleum products pipeline is 787 km (489 mi). Length of Natural gas pipelines is 10,402 km (6,464 mi). The above information was calculated in 2009. The China-Pakistan Economic Corridor is an under-construction development program to connect Gwadar Port in southern Pakistan to China's northwestern autonomous region of Xinjiang via highways, railways and pipelines to transport oil and gas. Chinese Premier Li Keqiang was among the first advocates of the project; since then Chinese President Xi Jinping, formar Pakistani President Asif Ali Zardari and Pakistani prime minister Nawaz Sharif have become strong supporters of the project. When the corridor is constructed, it will serve as a primary gateway for trade between China and the Middle East and Africa; in particular, oil from the Middle East could be offloaded at Gwadar, which is located just outside the mouth of the Persian Gulf, and transported to China through the Baluchistan province in Pakistan. Such a link would vastly shorten the 12,000-kilometre route that Mideast oil supplies must now take to reach Chinese ports. The project received a major boost when control of Gwadar was transferred to China's state-owned China Overseas Ports Holding in February 2013. Built by Chinese workers and opened in 2007, Gwadar is undergoing a major expansion to turn it into a full-fledged, deep-water commercial port. On 19 February 2014, the South China Morning Post reported that Pakistan and China have signed agreements for constructing an international airport at Gwadar, for upgrading a section of the 1,300-kilometre Karakorum Highway connecting to Islamabad, and for a fibre-optic cable to be laid from the Chinese border to the Pakistani city of Rawalpindi. According to The Diplomat, with the development of the corridor, Central Asia, traditionally an economically closed region owing to its geography and lack of infrastructure, will have greater access to the sea and to the global trade network. Pak-China Economic Corridor Secretariat was inaugurated in Islamabad on August 27, 2013. Wikimedia Commons has media related to Transport in Pakistan. ^ Stations connected by transfers are counted as one station, unless otherwise noted. ^ "Imran Khan sworn-in as PM Pakistan". PakTribune. Retrieved 2018-08-18. ^ "Lahore Metro Bus service inaugurated". The News International. 10 February 2013. Retrieved 24 May 2014. ^ "Shahbaz to inaugurate work on Metro Bus Service on Feb 28". Dawn. 28 February 2014. Retrieved 24 May 2014. ^ a b The Central Intelligence Agency. "World Factbook – Pakistan". Retrieved 2007-06-28. ^ "First Pakistani metro train to run in Lahore | | thenews.com.pk | Karachi". thenews.com.pk. 2014-05-23. Retrieved 2018-08-18. ^ "City to lose 620 trees for Orange Line train". ^ Associated Press of Pakistan. "PR signs deal with foreign firm for pre-feasibility study of Pakistan-China rail link". Archived from the original on 2007-09-27. Retrieved 2007-06-28. ^ Dr John Stubbs (2007-01-01). "Closing the gap from Bam to Zahedan". Railway Gazette International. Archived from the original on 2010-12-21. ^ "First container train service from Islamabad to Turkey begins Today". Pakistan Times. 2009-08-15. Archived from the original on 2011-07-19. Retrieved 2009-08-15. ^ "Leading News Resource of Pakistan". Daily Times. Retrieved 2009-08-15. ^ "Pakistan | PM launches trial phase of Pak-Turkey train service". Dawn.Com. Retrieved 2009-08-15. ^ "Pakistan–Turkey rail trial starts". BBC News. 2009-08-14. Retrieved 2009-08-16. ^ The Pakistan-China Corridor: A new project will give Pakistan the tools of globalization. Will it use them? This page was last edited on 16 April 2019, at 18:13 (UTC).